Visit out newly remodeled Tasting Room and savor our selection of delicious wines. You'll enjoy wines produced at the winery and an international selection of fine wines imported by Kedem's parent company, Royal Wine Corp. We feature a wide variety of wines to taste from New York State, California, Australia, France, Italy, Israel, Chile, Spain, Portugal, New Zealand, and Hungary. For the children, we offer a generous assortment of our natural Kedem grape juice. 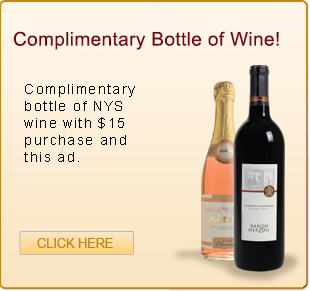 Enjoy a day at the Kedem Winery in the scenic Hudson Valley absolutely free! 2 FREE Bottles of Wine!